Native to coastal areas, where it is often found behind sand dunes and in vine thickets, this species is hardy and salt tolerant. The pinnate leaves have 2-6 pairs of leaflets, and there is a small weak spine where you could expect to find a terminal leaflet, the apex is often notched. 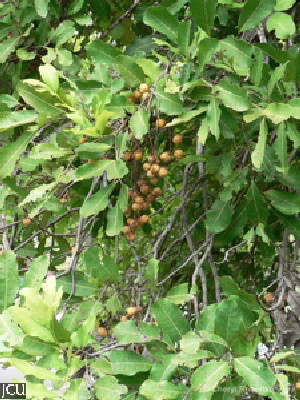 The small greenish-white flowers are followed, by sprays of yellow to orange 3-lobed fruits, which split open when mature to reveal black or dark brown seeds nearly covered by a bright red aril. Fruiting in November. The larvae of about 10 species of the lycaenid family of blue butterflies are known to feed on the foliage, in turn the larvae are attacked by some beetle larvae!